today announced that Atlanta’s new $1.5 billion stadium, home to the NFL Atlanta Falcons football team and MLS Atlanta United soccer club and site of the recent NCAA national college football championship, is protecting fans, personnel and athletes from terrorists and errant drivers from using vehicles as weapons. Installed by Tusco (Cottondale, Ala.), using Delta Scientific perimeter protection products, the new access system includes four DSC501 barriers, five DSC720 bollards, 39 DSC2000 barriers and 59 DSC680 fixed bollards. Five retractable DSC720 bollards were used at the pedestrian entry areas. This is Delta’s highest crash rated bollard, stopping a 15,000 pound vehicle at 50 mph. The bollard will stop and destroy much larger vehicles than those tested at very high velocities. The DSC720 is 35 inches tall and 15 inches wide. At Mercedes-Benz Stadium, the bollards feature brushed stainless steel sleeves. At the loading docks, 39 of Delta’s fastest, smallest and shallowest foundation barricades were implemented. 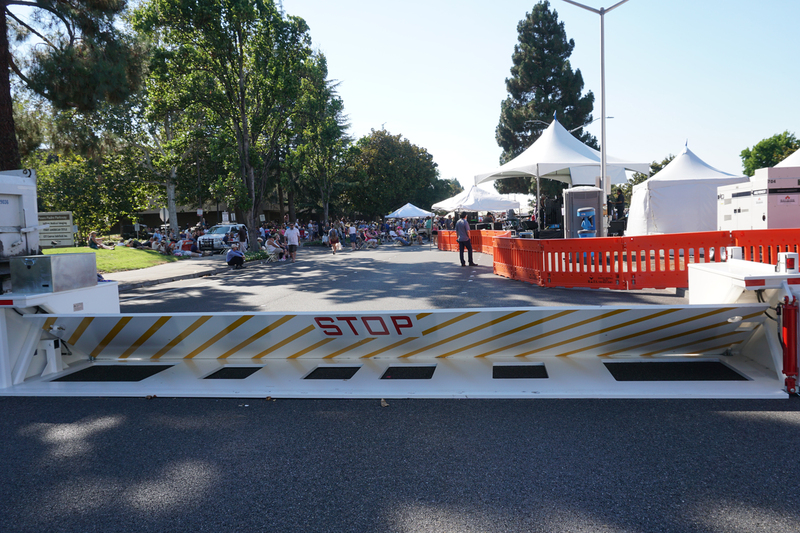 Chosen especially for high speed applications and ease of installation, the cost effective DSC2000 barrier is K12 crash certified with no penetration, meaning it will stop a 15,000 pound vehicle traveling 50 mph dead in its tracks. The ten-inch shallow foundation also reduces installation complexity, time, materials and corresponding costs. Lastly, 50 DSC680 shallow foundation fixed bollards with stainless steel sleeves protect pedestrian areas. They secure any unprotected locations where vehicle bombers and errant drivers have no obstacles. The system also includes Delta Scientific hydraulic power units and features touchscreen controls.